Big Oil may be ignoring the rapid growth of solar and wind energy at its own peril. The world might still get the majority of its energy needs from fossil fuels like oil and coal, but governments have begun to crack down on carbon. And consumers are shifting to cleaner options like solar panels and Tesla's electric cars. "Wind and solar are poised to radically reshape energy markets," analysts at oil and gas consultancy Wood Mackenzie wrote in a report this week, calling it the "biggest shift in strategic direction in a generation." Big Oil must spend $350 billion on wind and solar between now and 2035 in order to have their renewable market share match the 12% they currently hold in oil and gas, Wood MacKenzie estimates. "The shift to alternative energy is underway," the report said. "The transition is forcing the oil and gas industry to rethink its future." Related: Oil has a Tesla problem. But when will it hit? Up until this point, large oil companies like ExxonMobil (XOM) and Chevron (CVX) have avoided investing heavily in renewables. Critics have pointed to the high costs of solar and wind and the reliance on generous government subsidies that could fade away. But renewable energy costs have begun to come down, a trend that many expect will accelerate thanks to the billions of dollars being poured into new technologies. 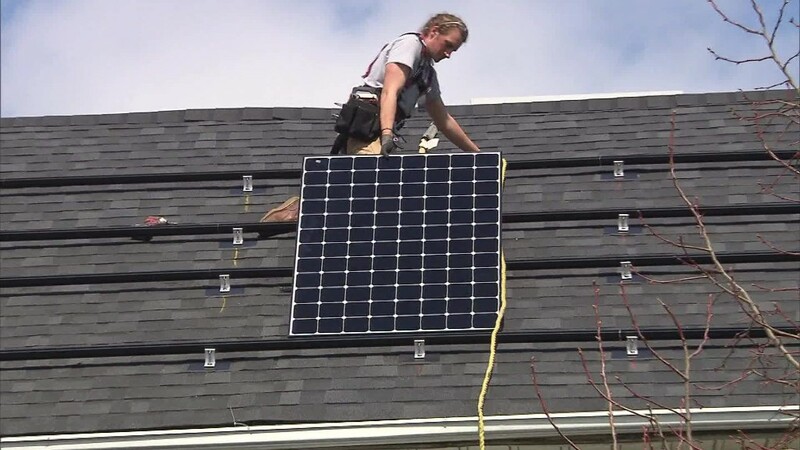 Solar costs alone have been roughly halved over the past five years. The growth is backed up by impressive job creation, with solar employment expanding last year 17 times faster than the total U.S. economy. All of this means there may now be a business case for Big Oil to diversify into cleaner forms of energy, if for no other reason than to protect its own future. "The growth opportunities in renewables cannot be ignored," Wood Mackenzie wrote, adding that "renewables pose a threat to legacy oil and gas operations." Of course, it would take a very long time before renewable energy can make up a meaningful portion of energy companies' total production. And the timing for future demand for oil is notoriously difficult to predict. Still, it is clear that fossil fuel investments no longer look as alluring as they once did. Oil and natural gas prices remain depressed due to serious gluts, forcing large energy companies to postpone long-term and expensive projects like deepwater drilling. Part of the problem is that governments have begun to crack down on carbon emissions amid heightened awareness about global warming. While the U.S. decided to withdraw from the Paris climate accord, most nations and many business leaders remain committed to the goal of boosting cleaner energy. That's why Wood Mackenzie has begun forecasting a "carbon constrained" scenario where oil demand peaks before 2030 and "enters a slow decline" as investor sentiment towards carbon "hardens." In that pessimistic scenario for fossil fuels, the firm estimates that solar and wind power could make up nearly one-quarter of the global power market by 2035. In this scenario, Wood Mackenzie says renewable energy could generate nearly three times more revenue by 2035 than all of U.S. shale. Big Oil does seem to be listening. Many energy companies have shifted towards natural gas, which is seen as a cleaner fossil fuel. European oil companies are moving more aggressively into renewables, with Norway's Statoil (STO) investing in offshore wind and France's Total acquiring solar companies. If Wood Mackenzi's predictions are true, much more will need to be done soon if oil companies want to ensure they aren't left behind in a cleaner energy world.